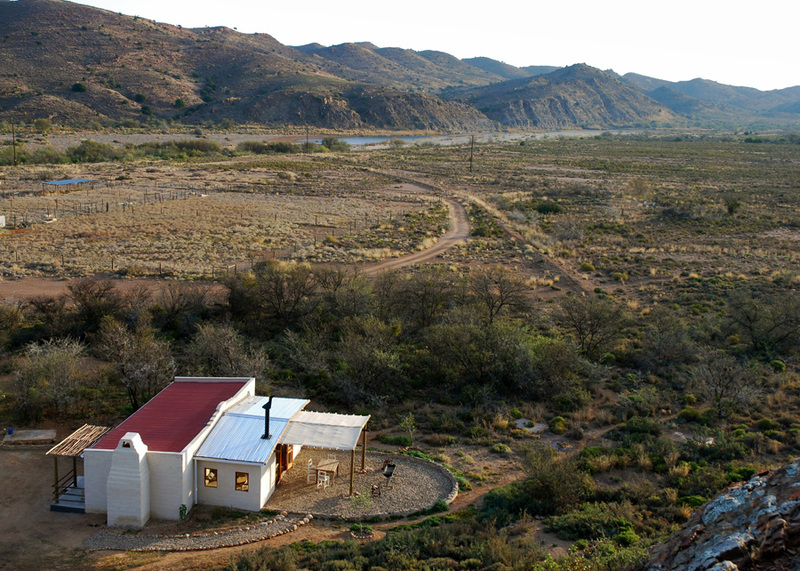 The Place is situated in the Klein Karoo wilderness between Ladismith and Riversdale, at the end of a private road in a beautiful secluded valley. Both our units are completely private, with each situated in it’s own unique setting in our valley. We welcome all well-behaved pets! The Place has been in our family since February 2011. Living here in this paradise wilderness has been one huge adventure - so much to do, learn, see, find...The Studio Flat forms part of the original ostrich chick building - we lovingly converted it whilst staying faithful to the building’s industrial origins and opened it for guests in November 2012. The Red Rock Cottage, originally a three-roomed workers cottage, was extended and renovated and opened for guests in September 2014. Our farm house was built in 1845 from adobe bricks made of local mud - we are in the process of renovating and modernising it. Both the Studio Flat and Red Rock Cottage are fully equipped for self-catering. Freshly baked bread, farm eggs from our 100-percent free-range chickens and any other organic farm or locally produced fresh produce can be purchased when available. 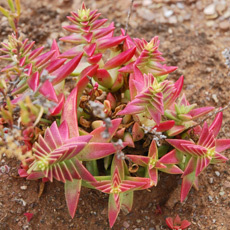 Things to do include exploring the amazing variety of landscape features on the farm – the magical mini-valleys, dry river beds, fossils and strange succulents that make our landscape so unique. Here you can bird watch and star gaze to your heart's content. The Touw River, which originates in Touwsrivier near Laingsburg many kilometres away, constantly astounds us with its beauty and variations. After very good or heavy rains, it swells and grows and moodily snakes it way downstream where it joins the Groot Rivier and later, the Gouritz River. These rare moments are for meditating on the power of nature and the staggering power of water. After a couple of days it calms to a gushing bubbling stream - chocolate box pretty. Then it settles in the pools and perhaps stops flowing entirely. We have spent many balmy summer evenings sitting on the large white sandy beach by the swimming hole; watching the sun set. Whilst the swim-hole usually has some water in it; we can only recommend swimming after good rains. 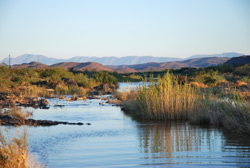 The Touw River usually has some water in it, but please enquire when you make your booking! Wildlife on the farm includes baboons - whose occasionally noisy socialising echoing off the cliffs is very entertaining - koedoe, small antelope, jackals and wild cats - all very shy and seldomly spotted although their footprints are often found at the water's edge - small and giant tortoises lurk under bushes - pale chanting gosshawks are often seen drifting on the air currents looking for prey, or perching on poles - Owls live in the woodland by the dam; probably feeding on the ample veldmuise, shrews and other small rodents on the farm - wild ducks, geese and several other water bird species breed at the dam and the river and every now and then a spoonbill can be spotted after good rain - and best of all, we regularly hear the hauntingly beautiful call of the fish eagle. There are of course, also spiders, scorpions, snakes, geckos and many different kinds of lizards. 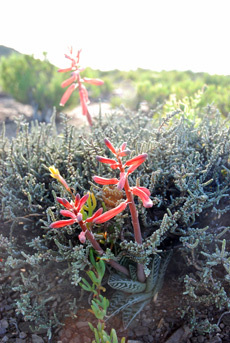 The Little Karoo (or Klein Karoo in Afrikaans) is well-known for its extraordinary richness of plant species.The Klein Karoo is an area of only 23,500 square kilometers stretching from Montagu in the west, to Uniondale in the east, bordered in the north by the Witteberg and Swartberg Mountain ranges; and in the south by the Langeberg and Tsitsikamma Mountains. 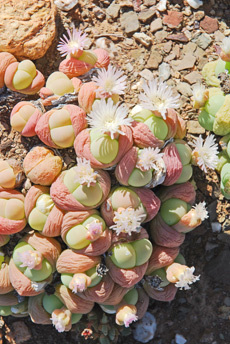 Despite the small footprint of this area, 3200 plant species have been recorded, of which 400 are endemic to the Klein Karoo. 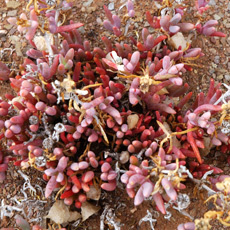 This diversity of plant life is rivalled only by the Western Cape fynbos biome; much of which also occurs in the Klein Karoo. We are compiling a full database of the plants found on the farm. Please feel free to enquire if you are hoping to view a particular species. 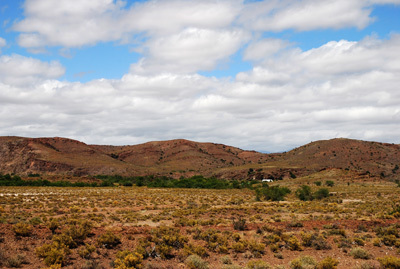 The Place has mainly River and Floodplain, Karoo Succulent and Gwarrie Veld habitats. Days are mostly sunny through all the seasons. 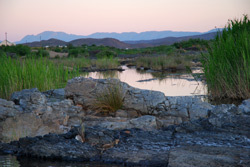 Summer maximum temperatures average about 35 degrees, but hot days are usually relieved by cool breezes in the afternoon that make uncomfortably warm nights a real rarity in the Klein Karoo. Winter days are generally warm - averaging in the low to mid twenties with cold nights and some frost in the mornings. Our best weather and most impressive skies are in spring and autumn when clouds sometimes gather for rain; but more often only result in another dramatic sunset.